Left: Native Trails founder Naomi Neilson. Right: One of Naomi’s favorite pieces, she has Avalon bathtub in her home. 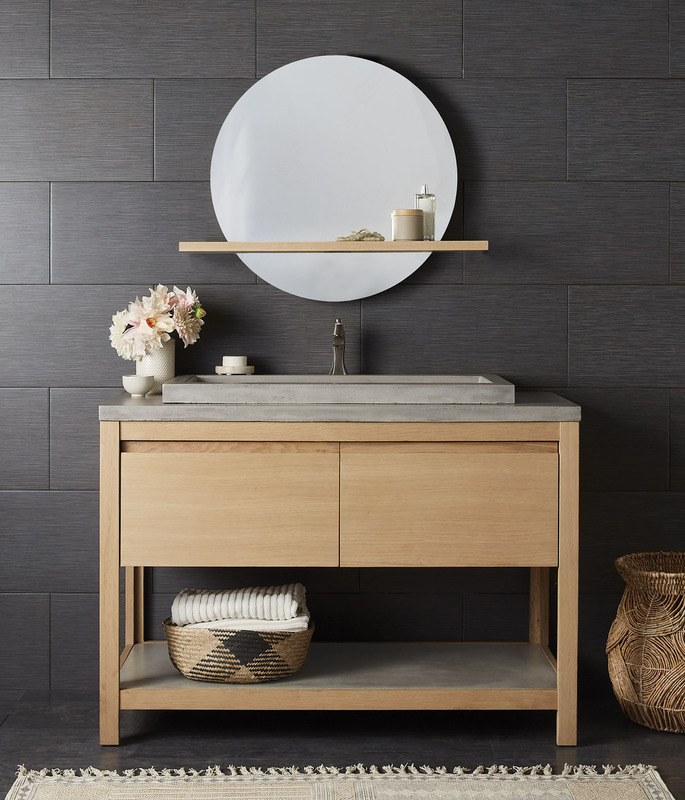 The Solace Vanity is one of our top picks from Native Trails. It has made in FSC certified oak and features a bottom concrete shelf. 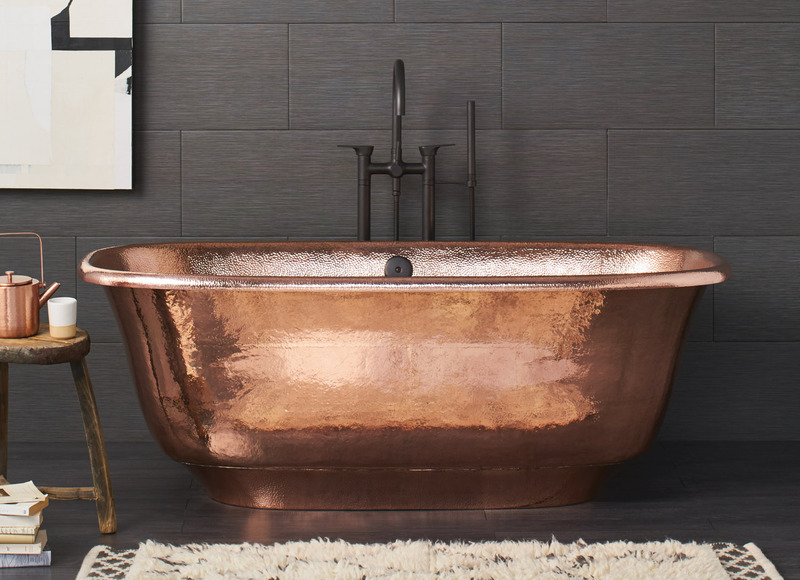 The Santorini Freestanding Tub is a show-stopping piece by Native Trails, where its signature hammered copper is featured. 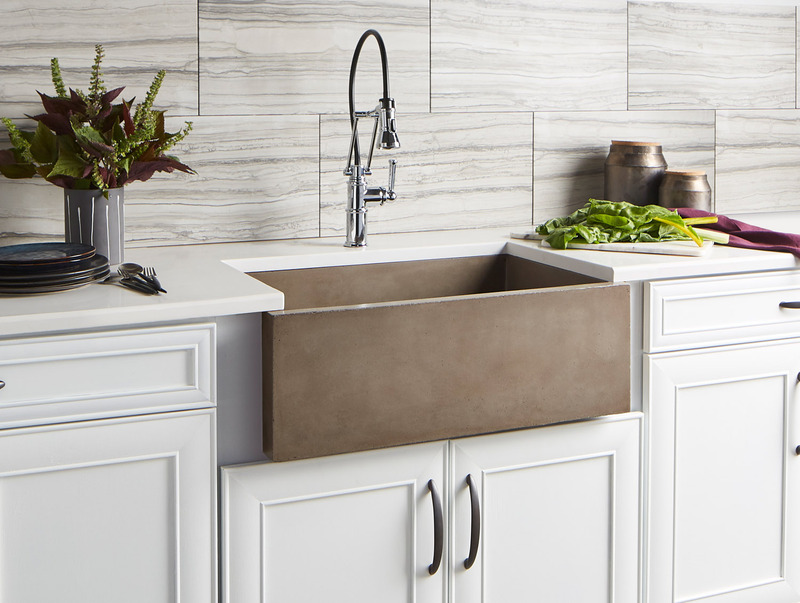 For those who don’t like how your typical metal kitchen sink gets scratched and dinged over time, the Farmhouse 2418 Sink is resistant to both, as well as stains. 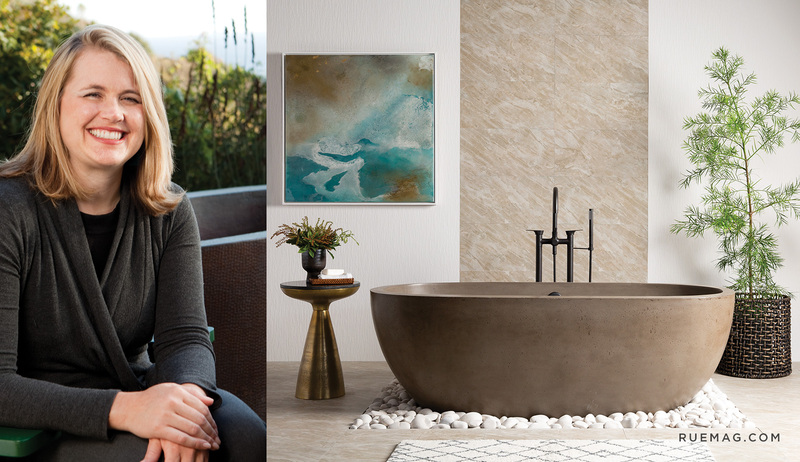 Back in 1996 when the concept of sophisticated and modern global design wasn’t yet trendy, Naomi Neilson founded the kitchen and bath company Native Trails. Known for their iconic hammered copper sinks, made by craftsmen in Mexico, Naomi expanded her company’s designs to include other artistically inspired pieces in other materials such as concrete, wood, and stone. Now, Native Trail’s earthy designs grace some of the most stylish of homes, supporting artisans around the world and their communities. We sat down with Naomi to hear more about her journey since 1996 and what makes her brand stand out. What was the first ever piece created by Native Trails? I started out driving my van all over Mexico, seeking out crafts villages and purchasing folk art. Over time, I started designing more functional pieces based on the same folk art techniques. There was a time when mermaids eating watermelons were a big thing for Native Trails! Did you have a background in design? I grew up around home design and renovation; my father and stepmother restored Craftsman and Victorian homes, which without a doubt was a significant influence on me. I suppose I have always been “crafty” – making jewelry and candles, drying flowers – whatever I could find to play with. I’ve always had an appreciation for true artists, and 25 years of being in this business is a hands-on learning experience daily! You were inspired by your travels when you came up with the concept for the company. What about those experiences sparked your creativity? Traveling through villages in central Mexico, I was struck by the creativity and talent I saw in many artisans, and also by the poor living conditions. I started to dream about how their lives might change if they had access to a broader market, where people would really value their work and their traditions. Native Trails truly has a multi-cultural foundation – many of your products are made ethically in Indonesia, Mexico and in the United States. Can you tell us about the artisans that you collaborate with? We started in the villages of central Mexico, the same ones that inspired me as a child. We work with coppersmiths who use centuries-old techniques and recycled copper to create our hammered copper and nickel sinks, tubs, and mirrors. They are simply amazing. As Native Trails began to grow, I started looking for other materials that might have an undiscovered second life to live, and I found local craftspeople right here on California’s central coast, who share my passion for sustainability. We partner with them to turn old fences and structures of the past into beautifully textured bath furniture. We also work with local wineries to turn their waste – high-quality oak from the winemaking process – into unexpectedly luxurious bath furniture and mirrors. We work with craftspeople in Vietnam to create our NativeStone Collection of sustainable concrete sinks and bathtubs. It’s a really unique and beautiful material that has really struck a chord with the design community. Natural jute fiber is combined with cement to create an eco-friendly concrete blend that is incredibly durable and stain resistant. We have artisans for smaller product lines in other areas as well. The focus is always on artisan crafted, sustainably produced products. And of course they must be beautiful, they must have that wow factor! It’s hard to know through a digital image whether a product for our kitchens and bathrooms is good quality. What makes the pieces from Native Trails high quality? You might say that our pieces are “perfectly imperfect.” We have rigorous quality control processes in place, and a lot of effort is put into achieving the perfect balance between handcrafted authenticity and meeting the specifications. It’s not easy! Each piece truly is one-of-a-kind, made by an individual, real live person, but it also needs to work for the destined space. Dimensions, weight, and other technical elements must match the designer’s or homeowner’s expectations. It’s a continual challenge that we both relish and dread! Is there a trend for kitchens and bathrooms that seems tired to you? There are a lot of styles that come and go and then come back again, so what may be tired today is reinvented tomorrow. We live in such a great time for design where you can take something tired and make it spectacular with just a tweak. I love the fact that being unique, even with something old, can feel entirely fresh and new. How about a fresh trend that you are loving at the moment? I love the metals and finishes that are out there right now, as well as all the textures. Mixing metals and new with old in design can be wonderfully unexpected. Reclaimed wood with polished nickel, concrete with beautiful oak or stainless steel – the mix is so inspiring. Tell us about the design of your personal bathroom – what pieces have you included and how does it show your design preferences? I have Native Trails pieces all over my home. I have added extra sinks – just because! My favorite piece at the moment is my Avalon bathtub, from our NativeStone Collection. In the kitchen, I’m in love with my Zuma apron front sink in hammered copper. Both pieces make me want to spend more time in those spaces. They have that “feel good” effect. Since Native Trails is about transporting us to more exotic places – could you share a favorite place in the world to be inspired by design? Spain is always incredibly inspiring to me – in fact, I just returned from Barcelona, one of the most design rich places in the world. I have to say, I always find inspiration of some kind whenever I travel, whether it’s in a Greek marketplace, a jungle in Central America, or a remote village in Vietnam. Each culture has something that I can take away – including my own community on the coast of California – it’s just a matter of being open to it.